This year’s Lifetime Achievement Award goes to a person at his happiest when he is working the land, but also, a character with a proven track record of making ambitious, pioneering and innovative plans come to fruition. An experienced viticulturist, our recipient has developed seven of his own vineyard sites in Marlborough, in addition to those under contract for other companies. 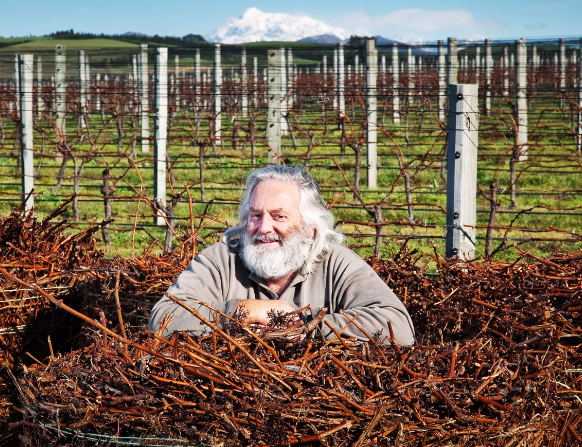 On the 8th day, of the 8th month, 2008, he opened a landmark winery, which was guided throughout by the New Zealand Green Building Code – and the first in the world to be certified carbon zero. Since then, among the many innovative green measures advanced by this person, he has pioneered the use of miniature Babydoll sheep to ‘mow’ his vineyards, the burning of baled vine prunings to create energy, and the spreading of a special compost mix from grape marc to fertilise his vineyards. Then, last month, inspired by his goals of not only being self-sufficient, but also ‘carbon negative’, he oversaw the construction of New Zealand’s largest solar panel installation at his winery. Such approaches were all created with one idea in mind – to be the world’s most sustainable wine producer, or, to put it in his own words, to ‘tread lightly, think boldly’. In short, this year’s award goes to someone with a long and distinguished career as a sustainable Marlborough grape grower and carbon negative wine producer. Peter, who is dealing with the aftermath of the earthquake in New Zealand on Monday, wasn’t able to attend the awards ceremony, but did send the drinks business an acceptance speech, which can watched below. This is such wonderful news, thoroughly deserved as we were able to witness on our visit to you earlier this year, following in John’s footsteps 50 years ago. Mimi and I were very, very grateful you were able to take yourself away from whatever work you were doing at the time to come over and greet us in your exceptionally wonderful winery and vineyard, … thank you again for that!